Western Bulldogs midfielder Josh Dunkley has set his sights on kicking more goals this season as he looks to reach the “absolute extreme limits” of his capabilities. A 2016 premiership player, Dunkley kicked 11 goals from 19 games last year mixing his time between midfield and attack. While he does not expect a significant change to that mix, the 22-year-old said he was determined to make himself a more dangerous option in the forward line, having “put on a fair bit of size” over the off-season. “I think you’ll see a few of us midfielders get down forward a little bit because there is that versatility side of the game,” Dunkley said. 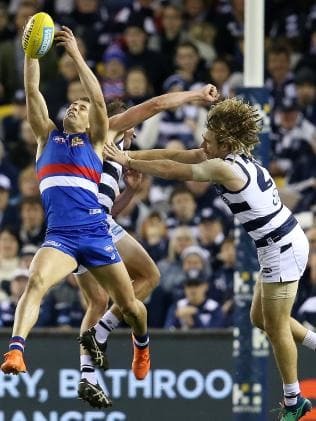 Dunkley said while the Bulldogs’ forward line did not work as it would have liked in their first JLT Series match against Gold Coast on Sunday night he was confident it would have a new-and-improved look this year. The Bulldogs ranked 15th for scores for last season, averaging just 71.6 points a game, and managed just 72 points in their five-point loss to the Suns in Mackay on Sunday. “Avenues to goal and being able to score has been a big priority for us,” Dunkley said. Dunkley and teammate Marcus Bontempelli travelled to the United States during their off-season break, spending a week at Nike headquarters in Portland and another week training with Olympic coach Dr Matt Kritz in San Diego. “I think the States stuff was knowing the sky’s the limit,” Dunkley said when asked what he had learnt from the trip. The Bulldogs meet St Kilda in their second and final pre-season match at Ballarat’s MARS Stadium on Sunday. I'm not sure I like this so much, he has the capacity to be a beast inside mid or a mediocre forward. Dunno though if the takeaway here is that he'll be sacrificing too many midfield minutes for forward duties -- more so that it's been put on the mid brigade as a whole to contribute scoring given our forward line has the consistency of a half-cooked omelette. Then again we did trial Wood forward so who the hell knows what we'll be open to trying in our many hours of need. He's talking contested marking so it sounds like there's a plan he'll spend time forward RS - if that is the plan, I'm leaning towards some of the negativity expressed after the weekend. He plays inside mid or not at all for mine - he's too slow to play forward. Have wondered if Libba returning complicates the midfield mix a bit....good problem to have, until they potentially make decisions like this. I'm not a huge fan of this - he was fantastic last year when "swapped" with McLean and directly contributed to our strong finish to the season. I guess it comes down to thinking Dunkley can be a better forward than Libba, and that they're about the same in the middle. Still don't think it's the best way to help Josh realise his long-term potential. Really not excited by this talk. He's an ok forward which when combined with his terrible goal kicking means he's a below average player when playing forward. When he played in the midfield he looked an above average player. I guess playing him in his likely best position would make him "inflexible". Would you play him in the middle ahead of Libba? Would you play them both together? I don't know if there's room for him and Libba together in the middle or for him and Wallis in the forward line together, and I agree that his kicking really mitigates his effectiveness up forward. He's too good to play in the seconds but not better than either of the above guys in their respective positions (although I could be convinced he's a better mid than Libba). It's a real headache and one I think we're going to have to watch play out on field. It doesn't need to be him or Libba. I would have him in centre clearances ahead of Macrae or McLean for example. They can be be effective outside and balance would be fine. Agree with the call on Macrae, but McLean is very effective inside the centre square and we should be utlilizing his skills in that part of the ground. He's said he doesn't expect a huge change to the mix of attack and midfield than he's played last year, but he just wants to use his ability to take contested marks and kick more goals. Not sure what the issue is really. All he's saying is he wants to be dangerous when playing forward. Agreed. Dunkley, Bont and McLean are all midfielders that are also capable forwards that will spend not insignificant amounts of time there. As a midfielder that spends time forward I would hope he can kick +20 goals this year. It's important that we have a good spread of goal kickers as it's unlikely we have anyone currently capable of kicking +50 a season. Given only 6-8 players kick 50+ goals a season across the league it's a massive stretch to think that we can produce one in 2019. Agree that we will need to share the load and improve on our conversion rates. Reckon he'll take turns forward when Libba is in the middle and swing back into a midfield roll when Libba is rested which may happen a fair bit in the first half of the season. It's more Wallis / Dunkley I have an issue with in the same side re. the forward line. All times are GMT +11. The time now is 06:48 PM.